Hand-crafted furniture built right here in Seattle, Washington. 40% Off Tommy Bahama, Lexington! Weiser Furniture, Appliance & Flooring Showroom | Visit our Showroom! I’ve always been fascinated by individual pieces of natural material and how each piece differs in character and charm. This especially rings true with me for wood. Trees are among the oldest inhabitants of this world. They have been here for millions of years preparing this place for us, cleaning the air, enriching the soil and providing the complex, perfect mixture of gasses for us to breathe. We would not be here without trees. So it is very important to me that when the living spirit of a tree ends, that I take great care in utilizing its form in a way that respectfully reflects and honors the life it provided us. I tend to spend a lot of time with each matched set of slabs listening to their voice to determine the most practical and beautiful way to create a table with a lasting impression. I liken people sitting around a table sharing a meal, creating plans, and gathering ideas, to a forest where the trees stand together contributing to each other for generations. And with this philosophy, I would like to introduce you to VIMANA. 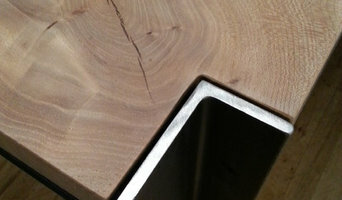 VIMANA is a Seattle based design company that specializes in unique, contemporary, live edge slab and steel table designs that blend form and function with old world craftsmanship. Each piece is hand-built from carefully selected, locally salvaged woods. Each table is hand built in Ballard, WA where direct access to the tree salvage teams as well as other reclaimed materials from the Seattle area are paramount to the process of creating the finest pieces of functional art of the highest quality that exceeds expectation. VIMANA has caught the eyes of some of Seattle and Portland’s top firms in 2013: Add3, Couch Seattle, Connors & Co. and Wax on Spa to name a few. But, VIMANA is more than custom tables. VIMANA is a vehicle. VIMANA is the oldest known word referring to airships, flying carpets, or Chariots of the Gods. VIMANA is a channel of creative freedom to do all things I desire to do with my art and design concepts. And like the VIMANAS of the old texts, I am free to go where my spirit and materials lead. Purposeful decor and custom high-funtion furniture and woodworking. Handcrafted with gratitude in Seattle, WA. We ship anything everywhere! Unique Home Furnishings is a one stop shop for all of your home décor and furnishing needs. Offering one-of-a-kind handcrafted furniture at attractive prices. "Many unique and totally cool furniture and decorator pieces. We have been looking for a small bar height table that matches our bar stools for two months at many furniture stores for a small kitchen area. Although you had many choices, we did not see exactly what we wanted. I appreciate the fact that you stopped us as we where leaving and offered catalog choices and ordering. Normally I do not like sales people following me out the door, but we liked your approach, and to our surprise you helped us find the perfect table, on order right now. Thank you Danaca for a good experience, and having fun working with you for the first time. We look forward upon delivery of our new table." Thos. Baker is a Pacific Northwest-based online retailer. We're located on Bainbridge Island directly west of Seattle across the scenic Puget Sound waterways of Washington State. Sophisticated, coastal-style decor and stylish outdoor living is our specialty. We offer premium outdoor furniture and accessories, to include rugs, pillows, throws, umbrellas, lighting, storage and protective covers. Our fire and heat products include artisan fire pits, fire tables, fire bowls, heaters and landscape lighting. We also have a full line of garden design products, such as planters, fountains, statuary accents, gazebos, trellis', arbors, pergolas, cabins, sheds and storage structures. For the home interior, we offer game room tables and sets, gaming accessories, leather club chairs and a host of accents for man caves and sophisticated men's interiors. Unique occasional tables, book shelves, home bars, wine bars, floor globes, vintage graphics, wall clocks, wall mirrors, nautical charts, floor and table lamps, fine collectibles and more. Thank you for stopping by and checking out our profile. If you have any questions or if we can be of service, please drop us a line here on Houzz, visit our website or give us a call. WorkSpaces Inc. makes home & commercial office furniture and designs offices for clients throughout the U.S. Because we can easily customize standard pieces, we provide you with a perfect fit while saving you money over exclusive designs. Space planning services are free. Our furniture is well engineered, uses high quality materials, and is built to last! As a modular freestanding system, it is easy to rearrange or take with you if you move. WorkSpaces furniture is mainly Made in America - wood/laminate tops and cabinets in the Pacific Northwest and metal cabinets in the Midwest - so turn-around times are short, usually 2-4 weeks to ship. What you see on Houzz is a fraction of the thousands of furniture designs and layouts we have completed since 1995. Keep in mind we have a large array of finishes – solid colors, wood grains and patterns – beyond our standard online finishes. Whether you are looking for a single desk or a complete office, we invite you to visit workspaces.com or give us a call and get started on your new office today! Seldens has been a Puget Sound Original and premier home furnishings destination for over four generations. We believe the dream of beautiful designer home furnishings should be a reality for everyone. It was in April of 1940 that Syd Selden opened his own floor-covering store with five employees. In more than seventy-five years of operation, Seldens has grown from the original five to more than 100 now, including many experienced, award winning interior designers. We’ve now expanded to make the dream possible beyond the Puget Sound region with the same trust and quality service that have made our name strong. Mid Century Modern - Revisited. We are a family owned and operated company that cares about quality. Make it stylish, make it once, make it quality. We use only the finest leather and cushions on our reproductions. Visit us today! Savvy Home provides the largest selection of customizable furniture. Categories include Reclining, Sleeper Sofas, Living Room, Rugs, Beds, and more! Whether you're starting a new home, taking the time to remodel, or downsizing to something more intimate, we're here to help make your home distinctly you. Industrial style bar stools and tables hand built from reclaimed wine barrels in Richland, Washington U.S.A. Custom metal fabrication and industrial design. Specializing in metal cladding (fireplace, back splash, trim), furniture, lighting and railings. We work with individuals, interior designers and architects to create modern works of exceptional quality. Our team of skilled craftspeople can inspire and create works of art within your budget. Our mission is to add an individual and personal touch to your home and outdoor space that keeps an innovative eye keenly concentrated on quality and finish. 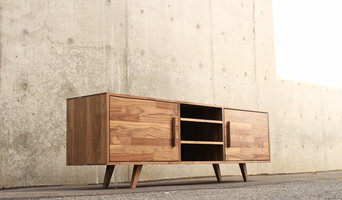 SML is a Seattle based furniture and design studio founded by husband and wife team, Sawyer and Sara. We design and build furniture, housewares, small goods, residential and commercial spaces, and custom products. We strive to create products and spaces that are durable and beautiful so you can cherish them for a lifetime. Whatever your situation, it’s always a good idea to do some research before visiting a Seattle, WA retailer or furnitures stores you find online. Start your research right here on Houzz. Read through Seattle professionals’ profile pages to find out location info, look at any photos of their work and check how long they've been in business. Read any reviews by design professionals and find out which furniture makers offer the best customer service. If your style or Washington space is unique, it will be wise to consult a custom furniture maker. Here are some related professionals and vendors to complement the work of furniture & accessories: Interior Designers & Decorators, Artists & Artisans, Kids & Nursery, Wardrobe Designers and Professional Organisers, Bedding & Bath. 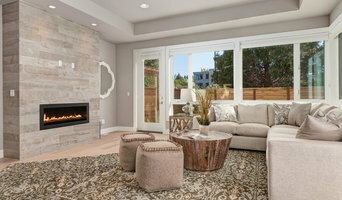 Many Washington home furnishers offer interior design consultations or room planning guides to get you started. Whether you decide to work with a home decor specialist or to become your own expert, it’s important not to rush the furniture-buying process. Visit plenty of Seattle, WA showrooms and stores so you can feel comfortable with your purchase. Find furniture and accessories manufacturers, showrooms and retailers on Houzz. Narrow your search in the Professionals section of the website to Seattle, WA furniture and accessories, then choose the nearest metro area for showrooms and retailers. Or you may want to look through Washington photos to find designs you like and contact the furniture manufacturers and showroom galleries directly.